The mouth of the Humber River, littered with debris in the aftermath of Monday’s storm. If you were a fish, you might be a little worried about exactly what Monday’s floods washed into Lake Ontario. After all, the surge far overwhelmed the capacity of our wastewater treatment plants, and it’s been acknowledged that some raw sewage was released, though the exact amount is unknown. But Ontario is a big lake, and for decades those who dwell on its shores have relied on this vast volume and some natural filtration systems to reduce pollutants to levels that, while certainly not ideal, are at least low enough that it’s safe to go swimming, most of the time. 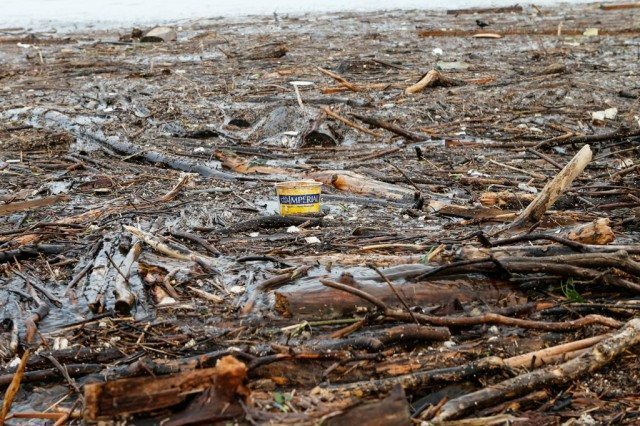 So is the danger posed by the storm only temporary, or will it have a lasting effect on the stability of the lake’s ecosystem? The answer, it turns out, is up to us. Water scientists and civil engineers talk about “100 year events,” a level of storm intensity that, based on past statistics, we can expect to see only about once a century. Monday’s storm certainly qualifies, but according to Gail Krantzberg, a professor of civil engineering at McMaster University, such events are becoming steadily more common. “The statistical norm for the 100 year event has been broken year after year for the past few years,” she says. Typically, sewer systems and wastewater treatment plants are designed based on the maximum intensity you’d expect during a much smaller window, only about two to three years. For larger events, the flow can be too great, and some of the extra water—in many areas a combination of rainwater and sanitary water from households—goes into overflow channels that empty directly into the lake. This is obviously not an ideal system, but it may not be as bad as it seems. Treatment plants rely on microorganisms that are naturally present in the water to break down organic matter and devour potential disease-causing bacteria like E. coli. The same process happens in the lake itself, albeit more slowly. 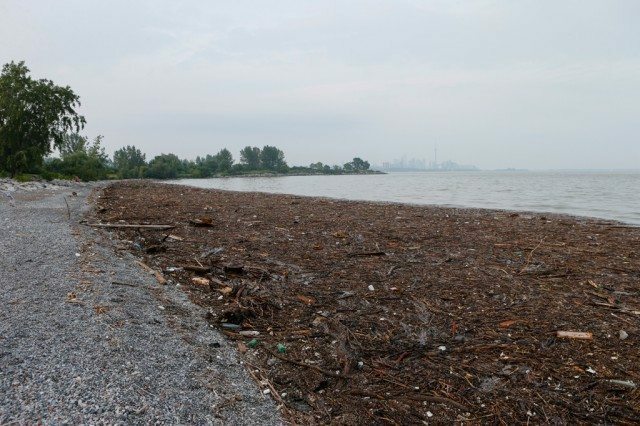 Lake Ontario has been dealing with bird and animal waste this way for millennia. So while it might be wise to stay away from the beaches for the next few days (indeed, many are still marked as unsafe), eventually the levels will drop back down to normal. So, all clear? Not so fast, says Krantzberg. “When that storm surge came through, it would have scoured the highways and parking lots,” she says. “All of those paved surfaces were full of things like heavy metals, hydrocarbons from car exhaust, corrosive materials, oil, and grease.” Oil and water don’t mix, so these contaminants tend to stick to particles of dirt rather than stay dissolved in the water. In the lake, this dirt becomes sediments, prime habitat for invertebrates and young fish. “They may be actually picking up more contamination in the short-term period, and that can move those contaminants up into the food chain,” says Krantzberg.